Is the Morris Jumel Mansion Haunted? The Morris Jumel mansion was built in the year 1765 by a British military officer named Roger Morris who built the home for himself and his American wife Mary Philipse Morris. They only lived in the house together for 10 years until the start of the American revolution when Roger fled to England, only to return 1777 when the city of New York was captured by the British. He remained here until 1783 until the revolution succeeded and he and his family fled permanently back to Britain. During the war the house saw its most famous visitor, George Washington stay here as he used the mansion as his temporary headquarters after he was pushed out of Brooklyn Heights during the battle of Long island. 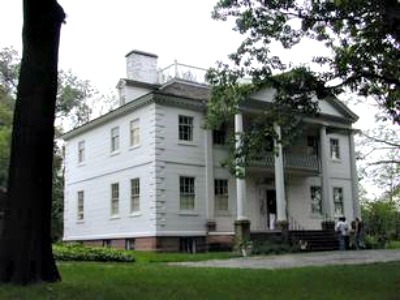 The mansion is also one of the only remaining landmarks of the Battle of Harlem Heights. The mansion was bought in 1810 by Stephen Jumel who moved from France to start a new life with his wife and former mistress Eliza Jumel. They had trouble integrating into New York social circles and moved back to France only a few years later, but after the death of her husband Eliza came back to the house and remained here until her death, being believed to have gone insane in her last few years. The house was purchased by the city of New York in 1903 and opened as a museum in 1904. It was declared a national historic landmark in 1961, with the exterior of the house declared as a New York city landmark in 1967 with the interior following in 1975. Today the house is open as a museum but if you wish to visit please check with the venue directly to check any seasonal opening times. There is thought to be 5 ghosts who chose to linger at the mansion, but the most well known and most commonly encountered is that of Eliza Jumel. After her husband passed away in 1832, she married the controversial ex vice president Aaron Burr. The marriage is thought to have been quite rocky and they divorced a few years later. After this Eliza is said to have started to decay mentally, to the point were she became completely insane until she eventually died alone in the house. She has been known to appear on occasion on the top floor or the outside balcony, but her most notable appearance was in 1964, when a group of school children who were touring the house saw her appear right in front of them, wearing a violet dress and promptly teling them to shut up before disappearing into thin air. The other main ghost here is thought to be that of her first husband Stephen. The official records state that he died in a carriage accident but a group of mediums who visited the house claimed they were able to make contact with him and were told that Eliza had murdered him by burying him alive. Whenever he has been seen in the house he is always accompanied by an intense coldness and has always been seen to be looking very sad. The identity of the other ghosts that linger here is unknown, but one is thought to be of a servant girl who once worked in the house. Her apparition has been seen on the top floor were the servant quarters used to be. The most well known story is that she became romantically involved with one of the family members in the house and due to various pressures ended up jumping out of one of the upstairs windows to her death. As for who the other spirits who linger here are will forever remain unknown, but claims have been made more than once about seeing civil war soldiers walking around the grounds of the house.